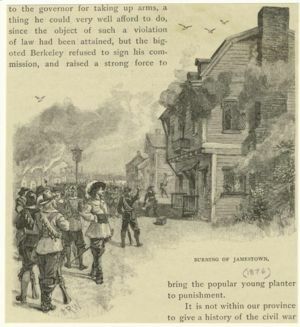 Burning of Jamestown during Bacon's Rebellion. Bacon's Rebellion was a revolt in 1676 by frontiersmen and indentured servants, in colonial Virginia. They were angry at the failure of the government to stop Indian raids. In 1675 the people of Virginia were ripe for a rebellion. The spark came from fear of Indian attacks and the feeling that the royal governor, Sir William Berkeley (1606-1677), was not doing his job to protect the colonists. In 1676, they rallied around Nathaniel Bacon, a recent arrival from England, as their leader against the Indians who had launched bloody raids against settlements on the northern and western frontiers. Bacon demanded the right to lead volunteers against all Indians, even those living peacefully within the colony, in retaliation. Berkeley, fearing unjust dispossession and slaughter of the friendly Indians, refused. Bacon ignored the governor's restriction and led volunteers to the southern frontier in May 1676, where he slaughtered and plundered the friendly Occaneechee Indians. Berkeley was furious but the colonists hailed him a hero. In his Declaration of the People, Bacon denounced the colonial government for doing little to protect the frontier farmlands and unjust taxation, among other things. When the governor attempted to call him to account, Bacon marched to Jamestown and, at gunpoint, forced the assembly to grant him formal authority to fight the Indian war, which he then prosecuted against another friendly tribe, the Pamunkey. Berkeley now attempted to raise forces to reestablish his own authority, and Bacon turned on the governor with his volunteers. Civil war ensued. Berkeley was driven to the eastern shore of Virginia; Bacon burned Jamestown, the capital. For a few months Bacon's word was law on the mainland; he may have been thinking of independence from the Empire. Suddenly, in October 1676, Bacon died of natural causes and his rebellion disintegrated. Berkeley, having recruited volunteers, defeated the remaining rebels, and, by February 1677, reestablished his authority. Soon thereafter 1,000 troops, sent by King Charles II to suppress the rebellion, arrived, accompanied by commissioners to investigate its causes. Berkeley had revenged himself by executing defeated rebels after quick courts martial, and for that was severely censured by the commissioners. They sent him to England to justify himself but Berkeley died before seeing the king. A central paradox in American history is the simultaneous rise of liberty and equality and the rise of slavery. With particular attention to Virginia, Morgan (1972) has offered a resolution of the paradox. Virginians feared the presence of large numbers of landless and dependent poor people as antithetical to political liberty and social well-being. Yet, this is what was happening in Virginia, leading to Bacon's Rebellion in 1676. Large numbers of young, armed, single white men had come to Virginia to seek their fortune. They worked on tobacco plantations for wages and few could expect to become planters. They became a source of peril to the established gentry. Governor Berkeley had lamented that "six parts of seven at least are poor, indebted, discontented, and armed." The gentry solved the problem after Bacon's rebellion by replacing the white men with black slaves. This reduced the need to import white servants, opened opportunities for whites who remained, and enabled Virginia to build its free political institutions upon slavery. Bacon's Rebellion was the first major rebellion in the American colonies in which free white men were involved. Wilcomb E. Washburn, Governor and the Rebel: A History of Bacon's Rebellion in Virginia, (1957), by a conservative historian. This page was last modified on 12 July 2016, at 21:35. This page has been accessed 41,394 times.